For the Fall of 2016, Speed and Strength expands the new SS1310 Lineup with the Speed and Strength SS1310 Bikes Are In My Blood Helmet which embraces their aggressive approach for sport riders in particular. This of course, is based on the platform of the Speed and Strength SS1310 Helmet, and while there have not been many updates to the helmet, the SS1310 didn't really need a refresh yet. As it is only a few months into its life, it offers excellent direct ventilation in a stable and aerodynamic profile designed to keep you cool and comfortable during takeoff. The field of view will also allow riders to see anything in their path with a large field of view, which is distortion free. The Bikes Are In My Blood graphic exemplifies their "All Out Attack" mentality with colors to match. The distinct matte black and white color options are a staple for Speed and Strength, and the new graphic is also offered in a bold orange, perfect for anyone on a KTM, Repsol CBR, or maybe even a custom painted bike. 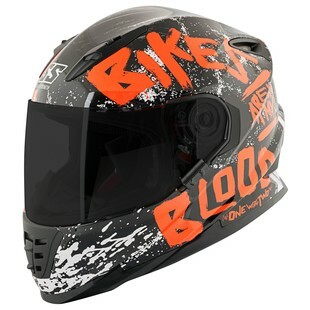 In summary, the Speed and Strength SS1310 Bikes Are In My Blood Helmet is built for any sport bike rider looking for a 'do it all' helmet that is easy on the wallet and heavy on the features. It's here to make a statement while of course, looking good.